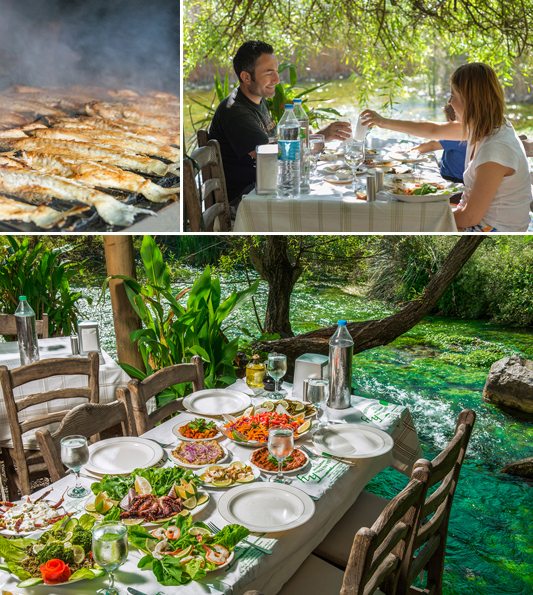 Halil’s place has been serving side of Gökova River with two different places since 1966, Halil’s place was build by Halil Þahin and now his sons Ali and Ahmet Þahin are going on to operates. Our two places can serve 600 people with 150 tables in summer and 250 people with 60 tables in winter. In our Restaurant, you can find breakfast, fresh sea fruits, barbecue, special cold appetizer, fresh vegetables end fruits and you can find more kind of wines and boozes. And you make trip in Gökova River with boat trips. Grand Halil Restaurant has been serving in Taþhan on road of Marmaris since 1997. It serve to 400 people with 100 tables in summer and 600 people with 15 tables in winter.